Lung cancer requires expert care. Our multidisciplinary team is here to help. 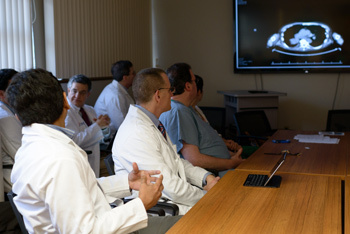 The UF Health Cancer Center’s Lung Cancer Program has expert medical professionals that offer evaluation and personalized management of patients with thoracic malignancies. Their range of expertise includes management of small cell and non-small cell lung cancer, as well as chest wall tumors, mesothelioma, thymic tumors, and other less common malignancies of the lung. The program is deeply committed to treating patients with exceptional skill, expertise, and compassion. These values assure that patients are treated with leading-edge therapies, including clinical trials, in a patient-centered setting. 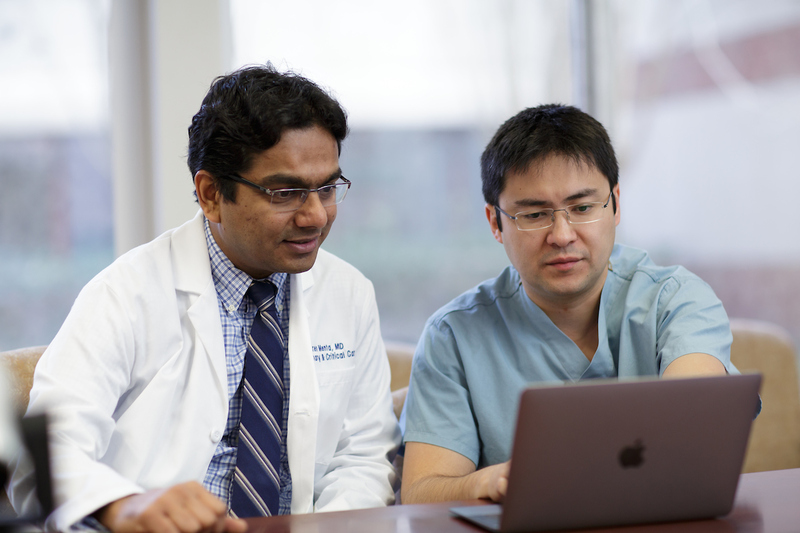 To ensure that care is streamlined, individualized, and focused on the patient’s needs, the lung cancer program incorporates a multidisciplinary approach to cancer management. Specialists from pulmonary medicine, thoracic surgery, medical oncology, radiation oncology, radiology, pathology, and nursing work as a team to care for each patient. Our lung cancer nurse navigator, Stacey Reeves, RN, provides a direct link between our patients and the multidisciplinary care team by acting as a patient advocate, communicating patient and family concerns, coordinating clinic visits and setting up appointments within the UF Health system. Majority of lung cancer surgeries are done with minimally invasive approach (VATS and Robotics) with significant decrease in length of hospital stay. 100% non-squamous lung cancers gets their tumor samples analyzed for molecular markers to identify patients who will qualify for personalized therapy. In addition to testing for PD-L1, ALK, and ROS1 status, we test for mutations in 115 cancer genes in our in-house molecular pipeline. We know that cancer patients often need a combination of therapies to manage their disease. UF Health has a highly-regarded network of leading-edge cancer treatment resources. To ensure streamlined, individualized care that is focused on the patient’s needs, the UF Health Lung Cancer Center incorporates a multidisciplinary approach to cancer management. This means that specialists from pulmonary medicine, thoracic (chest) surgery, medical oncology, radiation oncology, radiology, pathology, and oncology nursing work as a team to care for each patient. Patients meet with a number of practitioners at their first visit to our multidisciplinary clinic. Those practitioners then meet as a team to discuss and coordinate each patient’s treatment plan. We may also determine at this time if a patient is a suitable candidate for one of our clinical trials.